In our first post about visiting the Baja, we chronicled our three day journey just to get to La Paz, Baja California Sur. By Monday morning, 10:00 am local time, we had arrived. 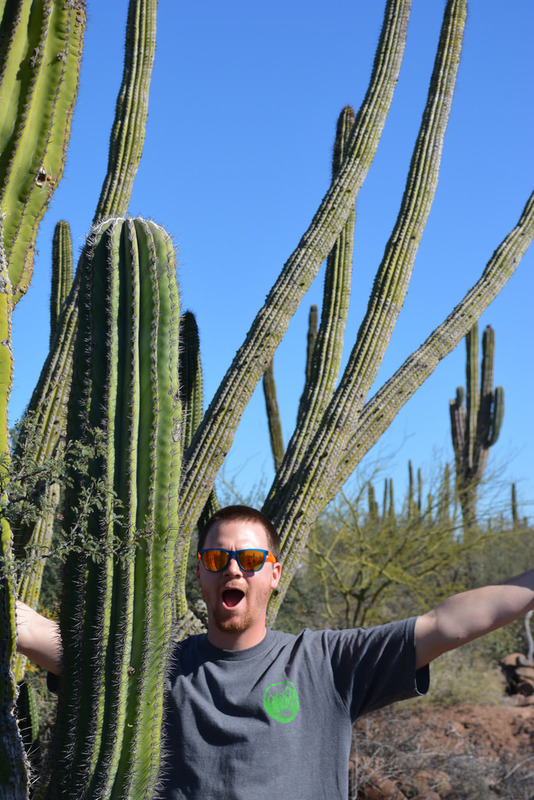 We wanted to get the fun part of our journey started ASAP, so we didn’t spend much time in La Paz. We hit the bank to take out some pesos, filled up on gas at the Pemex, and headed north. Our initial plan was to stop in Cuidad Constitucion for the first night, but as we found normal on the Baja, our plans changed with regularlity. 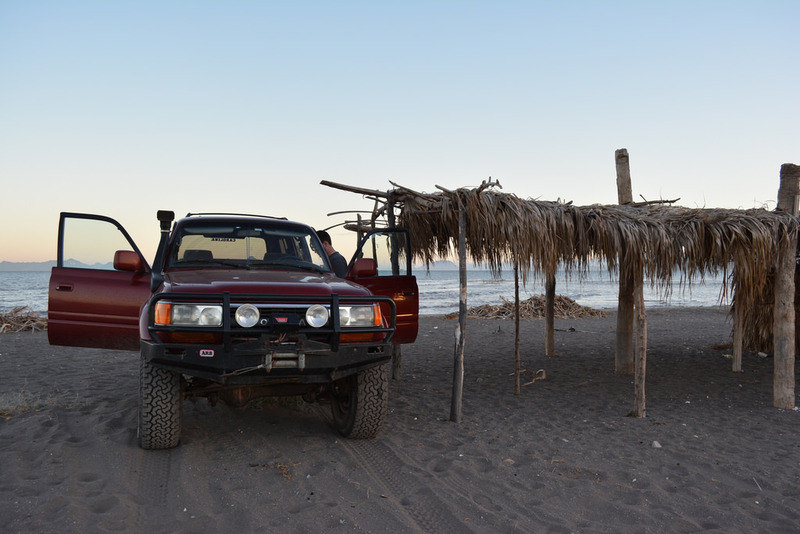 We decided to try to make it to the town of Loreto and find a place to camp on the beach. While we struggled initially with the concept known locally as “kilometers”, we estimated that we could easily get there before nightfall. We got in the truck and kept driving. The initial drive was sparse, but beautiful. 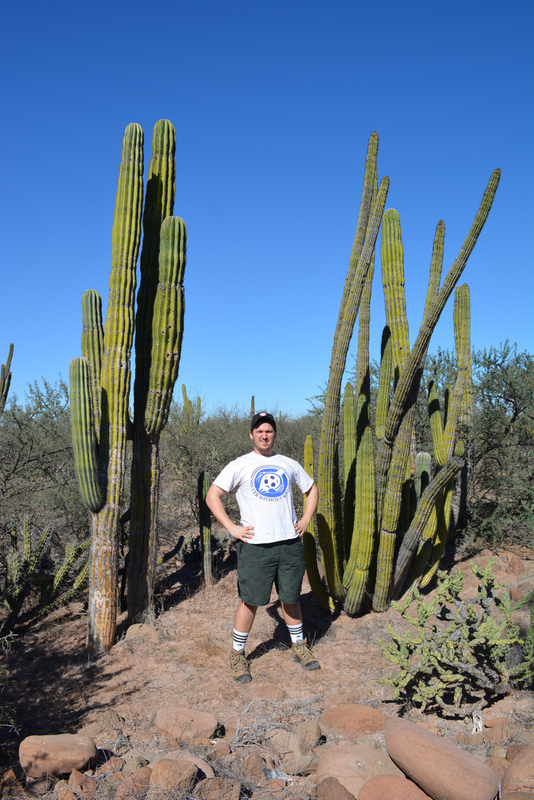 We even managed to find some cacti. 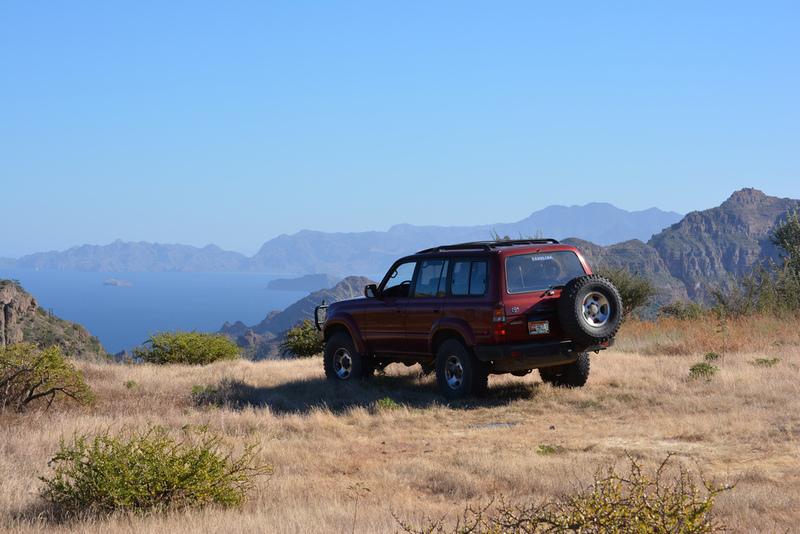 One of the coolest things we found about driving in the Baja were the side roads. Most of the roads, major highways included, were thoroughly deserted for long stretches, and every now and then a lonely, dusty track would peel off to one side. We regularly took off down one these side “roads” as an opportunity to explore. It often felt like we were the only people to have traveled down these routes for months, or even years. 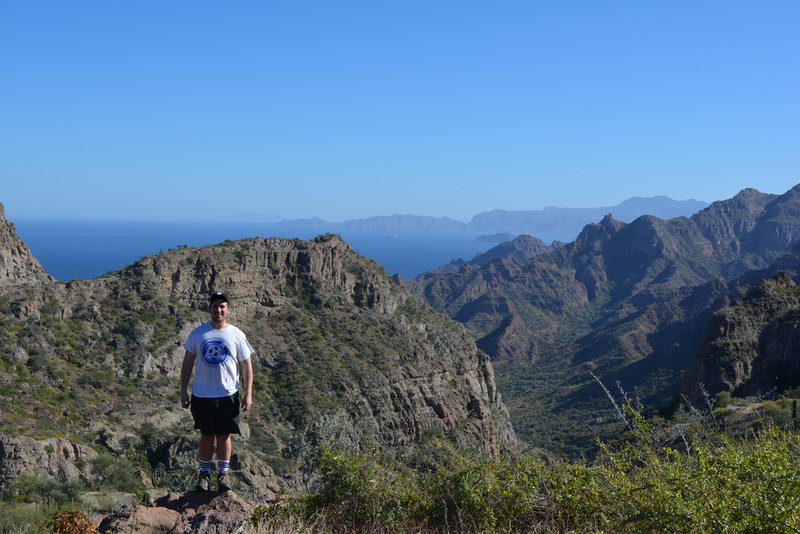 Roughly 30 km’s outside of Loreto, we took a chance on one such side track, hoping to catch a glimpse of the Sea of Cortez before coming down out of the mountains. We drove up a small grassy track, through some rocky hills, and popped up onto an awesome cliff overlook. Despite being clearly abandoned, we even found evidence of a campsite and fire put! We had some lunch and took some pictures of the majestic scenery. Gorgeous. The view’s not bad, either. Sadly, it was too early to make camp. 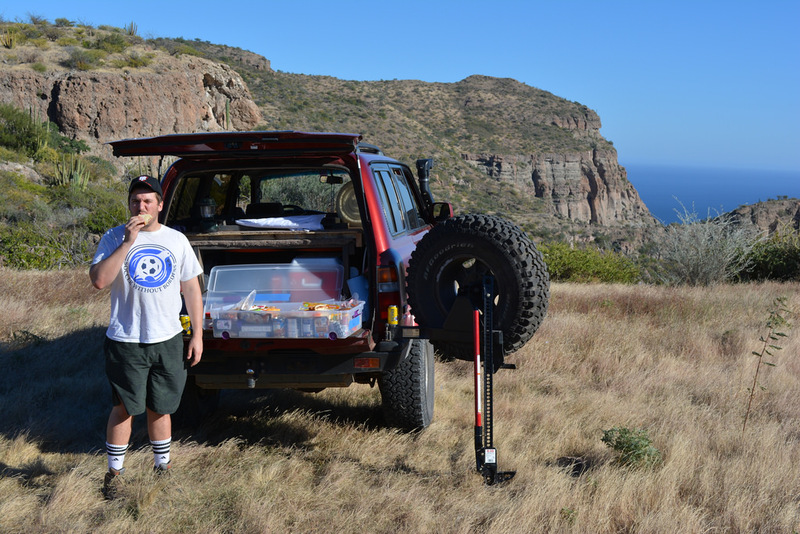 We had a little more driving to do before reaching Loreto. We pressed on. We made it into the town of Loreto in the late afternoon and set out trying to find a place to camp. 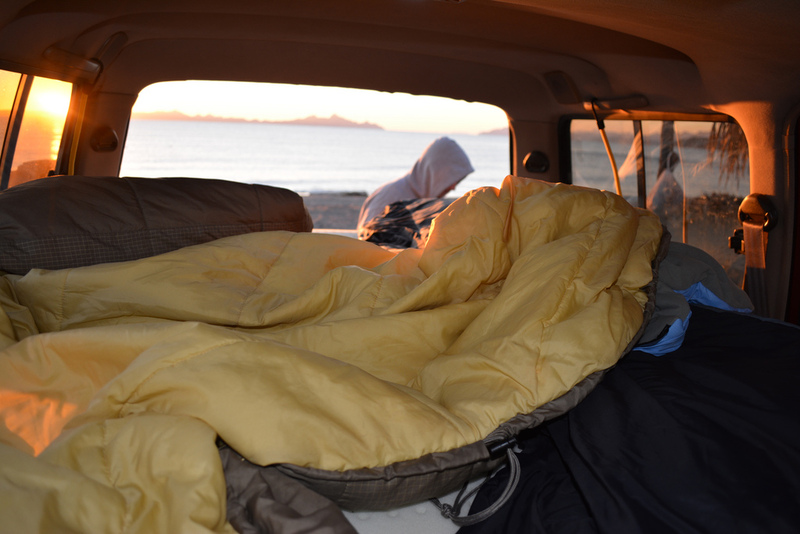 This was our first night on the Baja peninsula, so camping on the beach was a must. We drove through the middle of town, and were waved towards the outer edge. We found an RV park filled with very nice looking vehicles, and decided to ask for directions. A Canadian man was sitting outside his RV reading a book, and he claimed that there was a road used by the locals to get to the beach during the summer months. If we could find it, we could camp on the beach no problem! We thanked him, and in the waining light managed to find a dirt turn off that led us to the beach. We awoke at sunrise the next morning, completely refreshed. 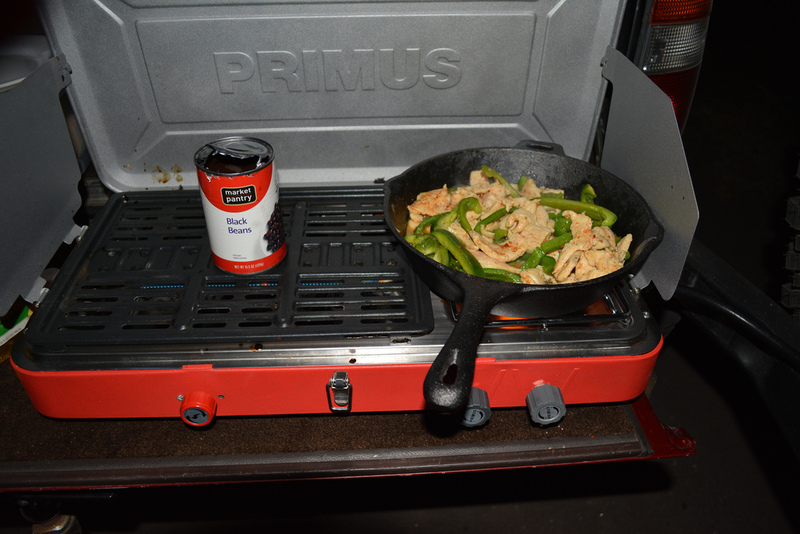 Day 5 of our trip begain with making coffee and oatmeal for breakfast and packing up the car. As our luck would have it, we ran into our Canadian friend from the RV park again! He was going for his morning walk along the beach, and recognized our behemoth of a car from the previous night. We offered him some coffee, only to discover that we only had two cups. We apologized, and ended up talking to him for quite some time about his trip and the Baja. 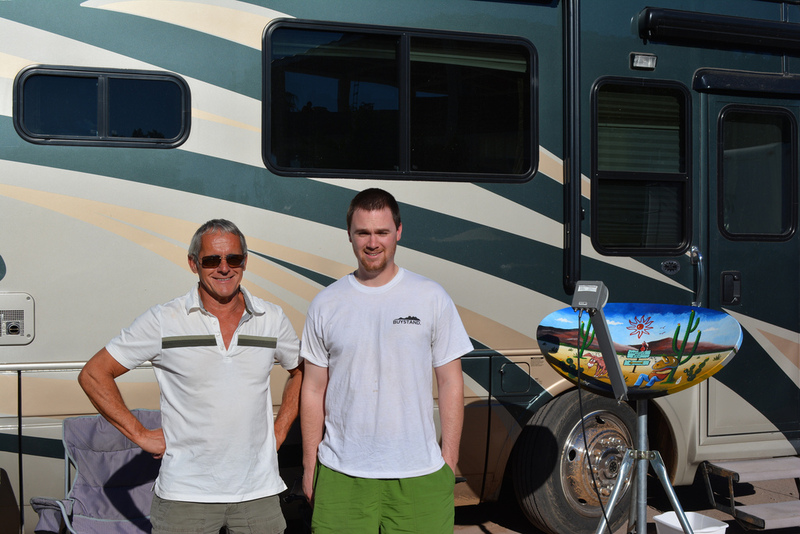 His name was Ernie, and it turns out that he and his wife were spending 6 months living in their RV in the Baja. His son had previously raced in the Baja 500. We were extremely jealous. He was also very knowledgeable on things to do and see while on the peninsula. My internet-based planning had been mostly me pointing at the map, and saying, “That looks cool”. Ernie recommended numerous places to see and his expert advice helped us to re-plan most of the second half of our Baja trip. Based on Ernie advice, that morning we headed up into the mountains north of Loreto to find the very old Mision San Javier, founded in 1699.